The Mekong Delta is the region in southwestern Vietnam where the Mekong River approaches and empties into the sea through a network of distributaries. 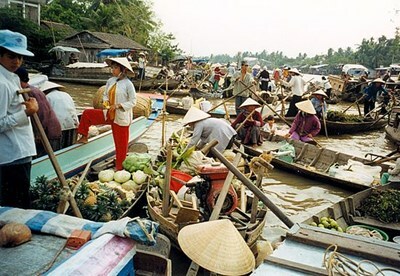 The Mekong delta region encompasses a large portion of southeastern Vietnam of 39,000 square kilometres (15,000 sq mi). The size of the area covered by water depends on the season. The Mekong Delta has recently been dubbed as a 'biological treasure trove'. This description uses material from the Wikipedia article on Mekong Delta and is licensed under the Creative Commons Attribution-ShareAlike License (view authors). Image by Doron. 56 people want to do this. 9 people have done this.